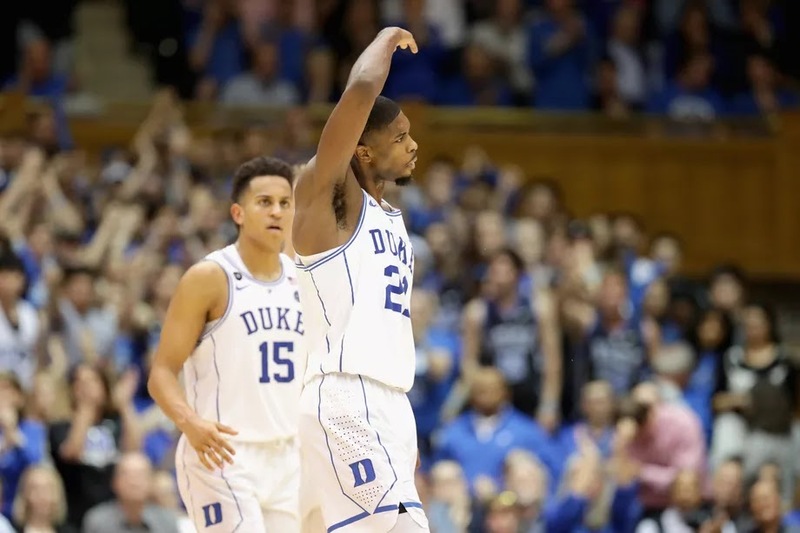 Home » Sports » Brooklyn - Can Duke Pull Off A Four-Game, Four-Day Tournament? Brooklyn - Can Duke Pull Off A Four-Game, Four-Day Tournament? What would Duke have to do to win in Brooklyn? Well it won’t be easy, not that it ever is. With 15 teams now there’s a huge advantage to finishing in the Top 4 and getting a double bye. That means you start play on Thursday and only have to play three games to win. If someone manages to advance from the Tuesday games, by the time they play a double bye team they’re already two games in. Duke opens on Wednesday which means four games to get to the Finals. Duke will open with the winner of State-Clemson. State’s a potential wild card. It wouldn’t be the first time the Pack makes a miracle run. Jim Valvano did it and Sidney Lowe made an incredible run in his first season. Clemson is just barely over .500 but as we’ve discussed before, the Tigers have been highly competitive all season. They should beat a dispirited State. In Cameron remember, Duke just barely nipped the Tigers. In New York, Duke will have a big advantage having played there often and having a substantial fan base. It remains to be seen how well everyone will travel with the tourney in Brooklyn. Duke already has a lot of people there. The next game will be interesting. Duke played at Louisville without Coach K and without Amile Jefferson and lost 78-69. Duke is much better now than they were then but so is Louisville. Rick Pitino has done a masterful job with this team. Duke should have a “home court” advantage, as we said, and perhaps a couple of others. There’s always been a theory that getting a bye is a double-edged sword because the lower-rated team has already played and is used to tournament conditions and pressure. And there’s one other factor as well, though we doubt it would get discussed much. Duke’s Coach K didn’t get to take part in the first game but we’re sure he watched and studied and had a lot of ideas. His proclivity to find positives in tough situations has led, we’re sure, to a much deeper level of watching that game and all the ACC teams. That’s the positive of not being there. But there’s also the military mind, the sense of duty, of not having been there when he was needed (this was something that was greatly misunderstood in 1995 when many people sneered that Krzyzewski stepped away to avoid a bad team. Nothing could have been further from the truth). All of that will factor in and if Duke advances, we would expect a supreme effort. That would make it tough to play UNC in the following game but Duke always gets up for the Tar Heels and a rematch in Brooklyn would be ratings gold. If Duke did manage to beat UNC, then the Finals would be very difficult. This is currently a team with a seven-man rotation. But Georgia won three games in 30 hours and twice in one day in the 2008 SEC tournament after a tornado hit the Georgia Dome and still won the whole thing - with a losing record. People remember Syracuse’s six-overtime game against UConn in the 2009 Big East tournament but most people forget they beat West Virginia the following day - in overtime. Seven overtimes in two days? A game that lasted three hours and forty five minutes? Incredible. They went on to give Louisville a solid game in the finals before yielding 76-66. So you can never say never. Still, four games in four days is hard. Everything about recruiting is speculation until it’s done (see: Barnes, Harrison). So keep that in mind when you read this piece on Kevin Knox. Michael Jordan would make an impression but what the hell did “the ceiling is the roof”mean? Just goes to show you that even the greatest can be great at confusing the hell out of you. CHAPEL HILL, N.C. -- Duke guard Grayson Allen was given a technical foul for elbowing North Carolina freshman Brandon Robinson in the first half of the Blue Devils' 90-83 loss to the Tar Heels. Officials initially called only a blocking foul on Robinson and did not assess the technical on Allen until going to the monitor to review. Robinson reacted to the contact immediately on the play, grabbing his nose in the process. Allen then made two free throws before Joel Berry II hit the two foul shots awarded to North Carolina for the technical. Allen finished the game with 14 points and was booed by the Dean E. Smith Center crowd throughout the game. Duke suspended Allen for one game for a tripping incident on Dec. 22 against Elon. It marked the third time in the past year that Allen intentionally tripped an opposing player. 0 Response to "Brooklyn - Can Duke Pull Off A Four-Game, Four-Day Tournament?"